Habit: Shrub, tree; dioecious (monoecious). Stem: trunk < 40 m; wood soft; bark smooth, bitter; buds scaly. Leaf: simple, alternate, deciduous; stipules generally present, deciduous or not, often large. Inflorescence: catkin [or various, or flowers 1]; each flower subtended by 1 bract. Flower: perianth modified into non-nectariferous, cup- or saucer-shaped structure or reduced to adaxial nectary (rarely also with abaxial nectary, then free or fused into shallow cup). Staminate Flower: stamens 2--many. Pistillate Flower: pistil 1, ovary superior to 1/2-inferior, chambers generally 2--4, placentas parietal, stigma lobes 2--4. Fruit: berry, drupe, or 2--4-valved capsule. Seed: often with basal tuft of hairs. Genera In Family: 58 genera, 1210 species: widespread in tropics, northern temperate, arctic. Note: Now including many genera (e.g., Flacourtia, Idesia, Xylosma) formerly in Flacourtiaceae, at least in part because of presence on leaf margins in both families of salicoid teeth (vein extending to tooth tip). In California (and generally outside California), Populus pollinated by wind, Salix by insects, wind. Hybrids common; identification often difficult. Habit: Shrub, tree; dioecious; bud scale 1, not sticky, margins generally fused (or free, overlapping). Stem: twigs generally flexible, generally not glaucous. 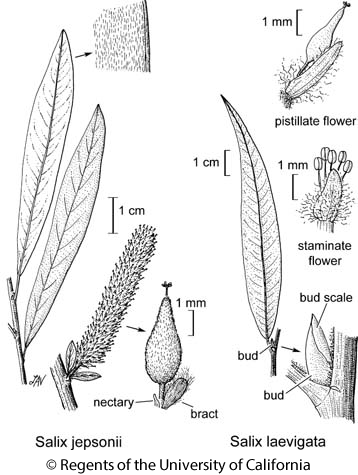 Leaf: generally alternate; stipules generally vestigial on first leaves, leaf-like on later; mature blade linear to broadly obovate, entire to toothed, generally +- hairy; petiole glands generally 0. Inflorescence: catkin, blooming before, with, or after leaves, sessile or terminating +- short leafy or bracted shoot ("on leafy shoot" or "on bracted shoot," "catkin length" including leafless or bractless part of subtending shoot); 1 flower bract subtending each flower, deciduous or persistent, brown, black, or 2-colored (paler proximally, darker distally; darker generally +- brown). Flower: perianth reduced to adaxial nectary (rarely also with abaxial nectary, then free or fused into shallow cup). Staminate Flower: stamens (1)2(10); nectary generally 1. Pistillate Flower: ovary stalked or sessile, style generally 1, stigmas 2, each 2-lobed, deciduous or persistent; nectary generally 1, generally rod-like. Fruit: valves 2. Species In Genus: +- 450 species: +- worldwide, especially northern temperate, arctic. Etymology: (Latin: ancient name) Note: Difficult, highly variable, many hybrids. Not all specimens key easily; sprouts, other extreme forms not included in keys, may require field comparisons. Studies of chromosome numbers, hybridization needed. Inclusion of Salix sessilifolia Nutt. in TJM (1993) based on misidentification of plants belonging to Salix melanopsis. Fruit length as given throughout excludes the stalk (stipe). Hair lengths: minute, < +- 0.5 mm; short, +- 0.5 mm; long, > +- 0.5 mm. Salix commutata Bebb, treated as misapplied to Salix eastwoodiae in TJM (1993), may occur in northern California mountains; Salix bonplandiana expected in s-most California. For alternate treatments, see Dorn (e.g., 2000 Brittonia 52:1--19). Unabridged Reference: Dorn, R. D. 1995. A taxonomic study of Salix section Cordatae subsection Luteae (Salicaceae). Brittonia 47: 160--174. Dorn, R. D. 1998. A taxonomic study of Salix section Longifoliae (Salicaceae) Brittonia 50: 193--210. Dorn, R. D. 2000. A taxonomic study of Salix sections Mexicanae and Viminella subsection Sitchenses (Salicaceae) in North America. Brittonia 52: 1--19. Habit: Tree < +- 20 m. Stem: twigs yellow- or red-brown, hairy, glabrous in age generally except at nodes, brittle at base; bud scale margins free, overlapping. Leaf: stipules generally leaf-like; petiole 3.5--18 mm, generally with glands; young leaves glabrous or white- or white-and-rusty-hairy; mature blade 53--190 mm, strap-shaped to lanceolate or obovate, acuminate to caudate (base convex to wedge-shaped), +- finely crenate, abaxial hairs generally densely short-soft-spreading, white or white and rusty, to 0. Inflorescence: blooming with or after leaves, pistillate 28--79 mm, on leafy shoots 3--14 mm (shoot leaves entire); flower bract +- tan; pistillate bracts deciduous. Staminate Flower: stamens 5; nectaries adaxial, abaxial. Pistillate Flower: ovary glabrous, stalk 1.4--2.8 mm, style 0.12--0.24 mm. Chromosomes: 2n=38. Synonyms: Salix bonplandiana Kunth var. laevigata (Bebb) Dorn; Salix laevigata var. congesta Bebb ex Rothr. ; Salix laevigata f. araquipa Jeps. Citation for this treatment: George W. Argus 2012, Salix laevigata, in Jepson Flora Project (eds.) Jepson eFlora, http://ucjeps.berkeley.edu/eflora/eflora_display.php?tid=42850, accessed on April 19, 2019. CA (exc MP, DSon); Markers link to CCH specimen records. Yellow markers indicate records that may provide evidence for eFlora range revision or may have georeferencing or identification issues. Purple markers indicate specimens collected from a garden, greenhouse, or other non-wild location.